The all-new Range Rover continues the tradition of all-terrain ability and comes now with a new suspension design, exterior and interior styling revision and a lightweight all-aluminum body structure. The 2014 Range Rover SUV is the flagship of Land Rover and has aeats up to five, a high level of luxury and performance on road and off road, and also comes now with the choice of a new powerful V6 engine, that replaces the naturally aspirated 5.0-liter V8 engine. The 2014 Range Rover comes in four models: Range Rover base, HSE, Supercharged and Autobiography. The Range Rover base comes standard with 19-inch five-spoke alloy wheels, dual-zone climate control, heated front seats, driver’s seat memory, five-mode seat massaging, 20-way power adjustable seat, keyless entry, keyless start, auto headlights, rain sensing wipers, hill descent control, powered split tailgate, a 380-watt Meridian sound system and a 8-inch touch screen with DVD playback and a navigation system. The Range Rover HSE adds 20-inch five-spoke alloy wheels, vent blades and door handles, body colored bumper, heated rear seats and upgraded leather upholstery. 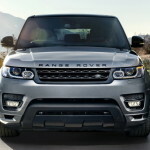 Range Rover Supercharged adds a new V6 engine and 21-inch 10-spoke alloy wheels. Options for these three models include heated wood and leather steering wheel, soft door closing, adaptive cruise control, rear seat entertainment system and active rear locking differential. The 2013 Buick Enclave is a full-size family crossover that is built on the same GM Lambda platform as the Chevrolet Traverse and the GMC Acadia. 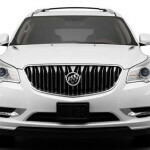 The new 2013 Buick Enclave has a beautifully restyled interior and dashboard, comfortable seats and well-insulated cabin. This three-row luxury crossover has also an ample cargo space, smart electronics interface and it is considered by the reviewers a car that offers an excellent value in terms of amenities, styling, space and efficiency. The 2013 Buick Enclave is offered in one trim level with a choice of three package levels, each of them being available with front-wheel drive or all-wheel drive. Every Buick Enclave comes standard with seven-passenger capacity. The 2013 Buick Enclave with the Convenience Group comes standard with 18-inch wheels, rear privacy glass, automatic xenon headlights, heated mirors, power liftgate, rear parking sensors, cruise control, remote ignition, tri-zone automatic climate control, a tilt-and-telescoping steering wheel, cloth upholstery, leather-wrapped steering wheel, an eight-way power driver seat, a rearview camera, active noise cancelation, dual outlet exhaust and a sound system with a CD player and an iPod/USB audio interface. Also present on the Enclave Convenience Group, is the IntelliLink electronics interface, which includes a 6.5-inch touchscreen, voice recognition and Bluetooth connectivity. 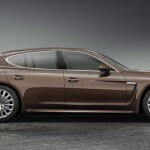 The 2013 Porsche Panamera is a four-door four-passenger luxury sedan with a hatchback-style trunk. One of the world’s best large sports sedan, the Porsche Panamera has luxury, space and performance, and competes with BMW 7 Series, Audi A8, Mercedes-Benz S-Class, Maserati Quattroporte and Aston Martin Rapide. The 2013 Porsche Panamera lineup includes rear-wheel-drive and all-wheel-drive model, and comes with naturally aspirated and turbocharged engine. The 2013 Panamera comes in base, base 4 (AWD), S, S E-Hybrid, 4S (AWD), 4S Executive, GTS, Turbo and Turbo Executive trim levels. The 2013 Porsche Panamera comes with rear-wheel drive, 18-inch wheels, LED daytime running lights, automatic xenon headlights, rear parking sensors, a sunroof, an auto-dimming mirrors, a tilt-and-telescoping steering wheel, dual-zone automatic climate control, driver memory functions, eight-way power front seats, a navigation system, a cooled glove compartment, heated front seats and 11-speaker audio system with Bluetooth and USB/iPod interface. The Panamera 4 is similarly equipped and adds Porsche’s variable all-wheel-drive system. The Panamera S E-Hybrid is also similarly equipped, but manually controlled air conditioning replaces the climate control and halogen headlights replace the xenon headlights. The 2013 Porsche Panamera S and all-wheel-drive 4S add an adaptive suspension, adaptive headlights, shift paddles and more interior lighting. The V8-powered GTS model comes with 19-inch wheels, 18-way active front seats and a sport-design steering wheel. The Panamera Turbo and Turbo Executive add 19-inch wheels (20-inch on Turbo Executive), front parking sensors, an adaptive air suspension, keyless ignition, keyless entry, a power-adjustable steering column, heated rear seats, a full leather interior and a 14-speaker Bose audio system. A very long options list is available for all models.